If you happen to be reading this right now, it means that you have arrived at the 100th column entry here at Triple B. Now, 100 columns is certainly a milestone worth noting and as it got closer there were increased thoughts at the Triple B Gigaplex regarding the best way to celebrate it. The first thought of how to celebrate the occasion was actually to not celebrate it at all. Let’s call this the “act like you’ve been there before” approach. In the act like you’ve been there approach one just continues doing what they have always done without drawing attention to reaching a particular milestone such as say the 100th entry made since January. For example, instead of talking about it being the 100th column the space could be devoted to discussing the fact that the 2014 Major League Baseball schedule was released yesterday and includes the Houston Astros opening the season at home against the New York Yankees. The 2014 Astros schedule also gives me the chance to see the Tampa Bay Rays, Baltimore Orioles, and Washington Nationals from the air conditioned comfort of Minute Maid Park. Or instead of pointing out that this is the 100th column we could talk about the cheating scandal that is rocking NASCAR and has led to a shake-up in which teams get to compete for the coveted championship. Another topic we could cover is the total disappointing effort put out by the Washington Redskins in Monday Night Football despite us going to the trouble of getting a special cookie cake for the occasion to go along with a tray of imported cheese, rosemary crackers and pinwheels. 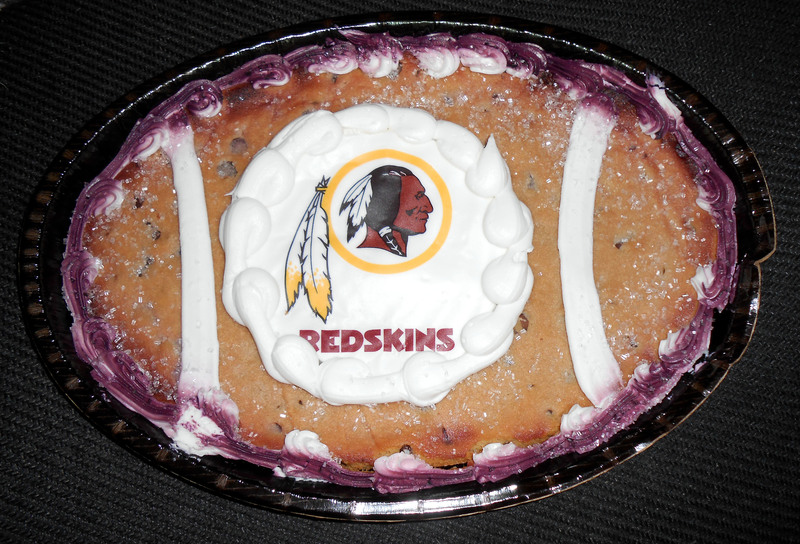 Instead of tasting sweet like victory, this Washington Redskins chocolate chip cookie cake tasted bitter after a lackluster effort by the Redskins in Monday Night Football. But that is not what we are here to talk about. One particular example of the excessive celebration in baseball is the walk off win. As the name implies a walk-off win occurs when the teams simply walk off the field after the home team has scored a decisive run in the bottom of the ninth inning that leads to a victory. I have never really understood baseball teams that choreograph routines for walk off celebrations. I get the emotion of the moment and the fact that the victory is secured but when some teams have set roles for people to play during a walk off celebration such as who get to catch the batting helmet as the runner touches home things have gone too far. With the act like you’ve been there approach ruled out thoughts on how to celebrate turned to the television clip show approach. I am sure everyone has watched a television show at one time or another that was comprised of clips from previous shows as the actors on the show “looked back” at pivotal moments of the past year. This approach usually involves a contrived set-up that allows for the seamless inclusion of remember when moments that serve as flashbacks for the viewer. One of my favorite shows growing up, MacGyver, was notorious for the clip show approach. It would never fail that each season would include a look back at shows and events which sometimes happened as far back as the episode that preceded the clip show. And then a clip would be shown of MacGyver disarming said device earlier that season armed with a Swiss Army Knife, a bottle cap and of course that all important non conductive whisker from a Russian Dwarf Hamster. Okay, to my knowledge Macgyver never disarmed a thermonuclear device with a hamster whisker. But if he did, and there was footage of that, I would certainly deem that to be clip show worthy. So if we were to take the clip show approach here I would say something like remember when we talked about how bad the Astros are this year? And of course that phrase would have been hyperlinked so that you could navigate back there to read the previous article about when we talked about how bad the Astros were. Although I think many of the past 99 columns referred to how bad the Astros were this year so that would be a lot of hyperlinks to have to go back and add. So instead of talking about the Astros we could say remember when we talked about (fill in the blank)? And of course the link would magically transport you back to reread that particular article. I was never really a big fan of the clip show approach when MacGyver did it and I am definitely not going to do it now since it always struck me as a cheap way for the writers to not really have to work hard at coming up with new material. With the act like you’ve been there before approach and the clip show approach being ruled out we had to think of a third way to celebrate the milestone of reaching 100 columns. 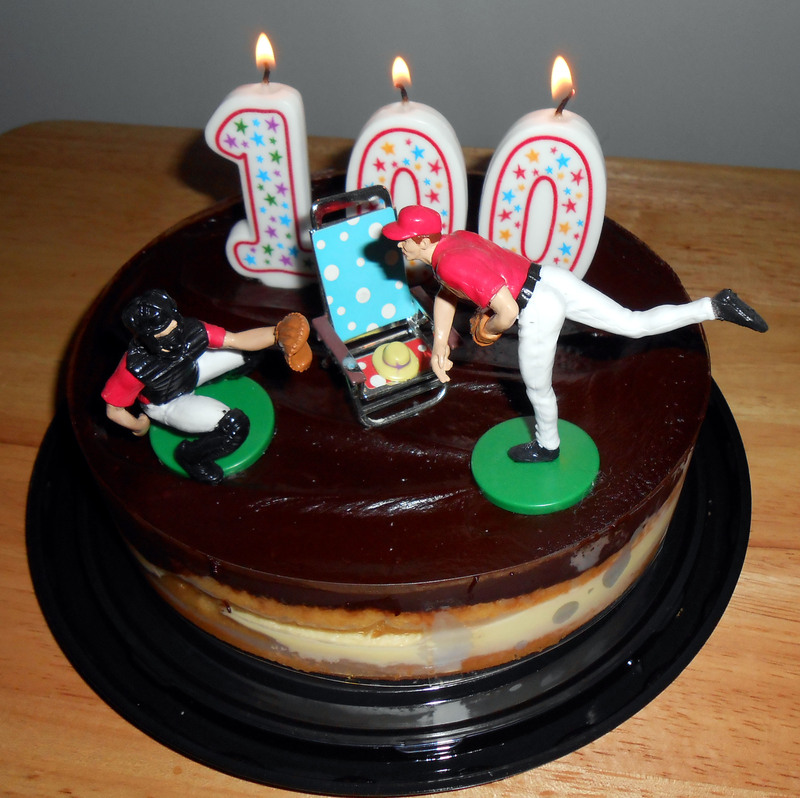 What better way to celebrate 100 columns than with some cake. That led us to the third way to mark the occasion of reaching our 100th column, we bought a cake and put some candles on it. I mean who doesn’t love baked goods? 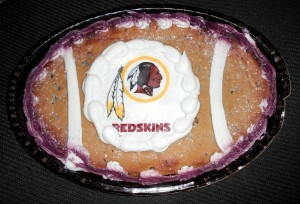 After all, remember a few paragraphs up when we were talking about a Washington Redskins cookie cake? So, there you have it, the 100th post here at Triple B.
Here’s to many more to come as we offer observations from the cheap seats, the beach seats and everywhere in between. Now if you’ll excuse me, I have some cake to eat. Of course, if you had been here yesterday I could have offered you a slice.